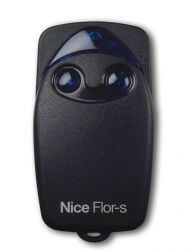 The Flor-S transmitter by Nice Gate Openers is one of the most versatile gate remote transmitters on the market. This remote was exclusively designed for the control of automation systems, such as opening devices for doors, gates, and roller shutters. This 433.92 MHz rolling code transmitter with self-learning function is the ideal solution for managing multi-use systems with a unique, personal code. The self-learning receivers are able to receive and store up to 256 codes. Since it is impossible to clone, its rolling-code transmission is 100% secure. The codes can be entered at a distance with an authorized transmitter, or with a programming button on the receiver while a LED displays the different functions. Our Flor-S transmitter meets PML433FRA FCC and 6140A-433FRA regulations! To learn more about this secure Apollo gate transmitter, please click on a photo below.